Star Warz represents all styles and evolutions within the Drum ‘n’ Bass scene and gives it’s public a broad look into the whole Drum ‘n’ Bass spectrum. 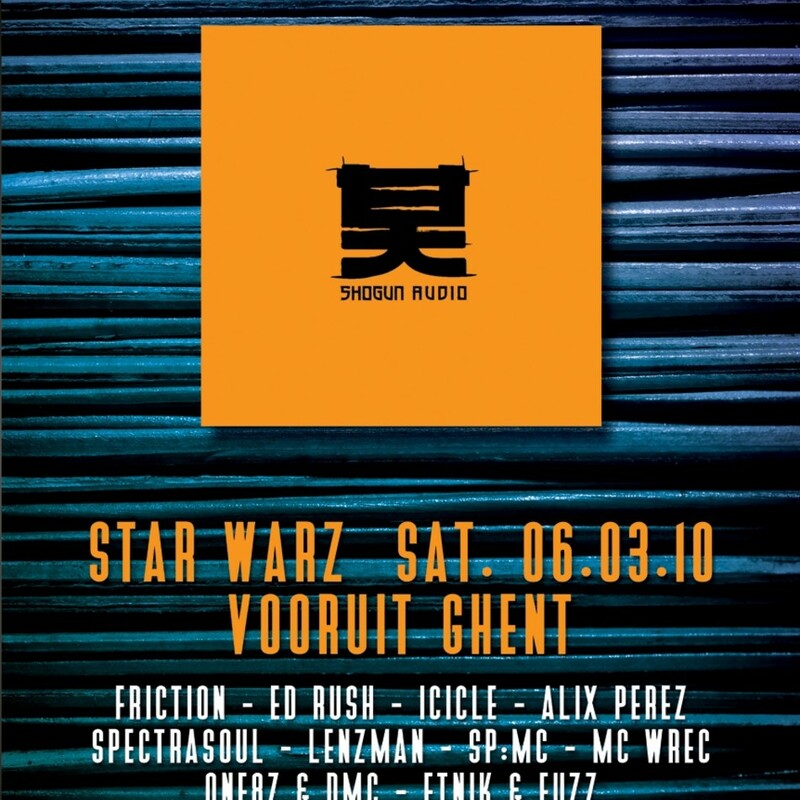 The Star Warz crowd is always treated with the best that Drum ‘n’ Bass has to offer…after an overwhelming and exclusive 15 Years of Metalheadz party, this time it is Shogun Audio who will make an appearance. Shogun Audio is the diverse, exciting, Brighton based Drum ‘n’ Bass label owned by DJ Friction. Since its inception in 2004 Shogun Audio has gone on to become one of the most essential labels in dance music today. Driven by it’s founders Friction and production partner K-Tee the Shogun brand has developed in such a way that it is now an all-encompassing Drum ‘n’ Bass juggernaut releasing anything from the deep and minimal sounds of Icicle to the dirty tech grooves of Break and the tear-out party anthems of Spor and indeed Friction & K-Tee themselves. Artists to have released music through Shogun include not only their exclusive signings of Alix Perez and Icicle but also the likes of Jonny L, Break, Marcus Intalex, Spectrasoul, Noisia, Klute and Spirit. In doing so the back catalogue has become one of absolute quality in a relatively short space of time. Aside from the superior A&R skills, a major part of the success has of course come from Friction, who has become a household name in Drum ‘n’ Bass and dance music over the past five years, and their highly successful club night at the sadly now defunct but legendary End club in London, UK. DJ-ing regularly to thousands around the world is his passion and his ability to entertain any crowd through the broad spectrum of Drum ‘n’ Bass has undoubtedly added to the legions of fans who now follow the Shogun stamp wherever it treads. Last year was their biggest year yet with the first volume of Friction’s all-new mix series ‘Assassin’ released to much critical acclaim and the debut album from Alix Perez ‘1984’. Add to these a slew of massive singles from Spor and Break amongst others, a successful new Shogun club night in their home town of Brighton, a string of high profile fans like Goldie, Zane Lowe, Annie Mac and Grooverider and there’s no question that only exciting successful times lay ahead for Shogun Audio! And that is the perfect time to have them over on Star Warz where they will be joined by a very special guest …none less than Ed Rush from Virus Recordings.